Can you guide me on accessing the audio on the go? I am using an iPhone. I want to catch up on some of this week's audios. I go into mail to find an email with a link to simplero - correct? In my case, the only one that seems to go roughly in the right direction is the 12th April one (all the others only go to single worksheets). When I get into that page, I am on the very first post from you on Day 1. All I can figure out is this: scroll to the bottom and click Next Page. Then do so on Day 2, Day 3, etc. Is this the only way? Can you give us some sort of direct link to the landing page where we can see what we have completed and what remains to be done? I have good news for you and all iPhone or iPad users. Once in the 31Day Challenge, towards the bottom of the menu, you will find a podcast link. 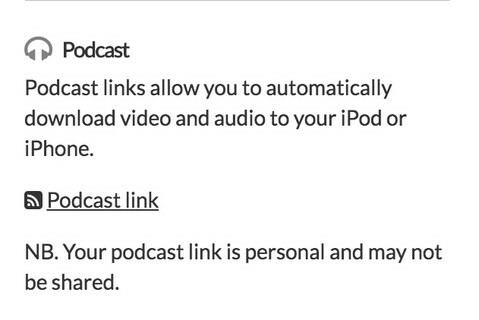 This link allows you to download any media file you have access to in the space and listen to it in itunes (Sorry, Apple music ;-)). All you have to do is click the link and the files will automatically download and open in your media player. I have bad news for Android and windows users, sorry this doesn't work easily, you need a special rss based podcast player and that is a pain to set up. I will check the email links. You can always get to the other days from the menu (top of the screen, three bars on mobile). Worksheets open in a new tab with no menu. Close the tab and you should see the page you left in the tab below. I was struggling as well Kathy, to get quick and obvious access to the current pages I was working on. Is it possible to have an icon on screen (on my mac or iphone?) that would go to the current pages, audio or worksheets? The Podcast link is in the sidebar and is unique for each user. It only works for iPhone and iPad users as there is no equivalent feed reader on the Mac desktop. I think what I could do is put all audio links on the week's page. "This week's audio MP3 files for example". Would that work for you? And link to the week beginning page in the email at the commencement of the week.